Do all of the prep work the night before, then just pop it in the oven in the morning, for an easy and delicious breakfast your whole family will love. Start by buttering a 9 x 13 baking dish. Lay the bread slices into a flat layer in the dish, trying not to leave too many holes. In a large bowl, whisk the eggs, whole milk, sugar and vanilla. Pour egg mixture over the bread in the pan. 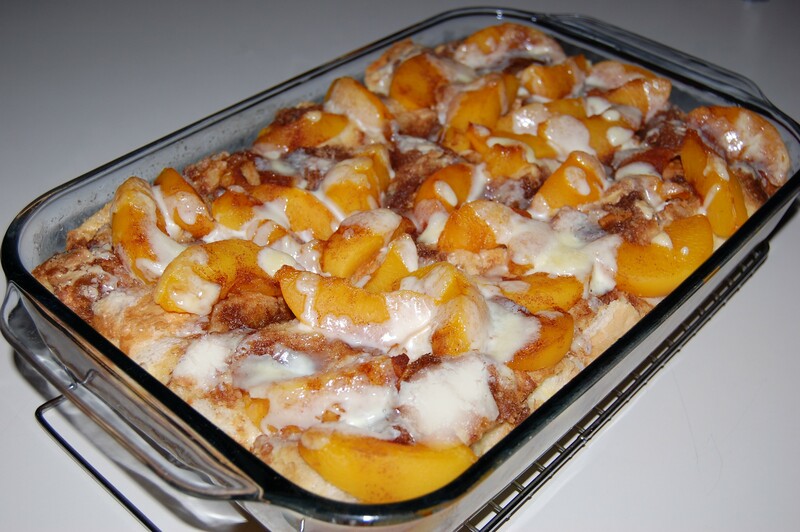 Arrange the peaches over the bread and sprinkle with the brown sugar and cinnamon. Cover tightly and refrigerate overnight or for at least 8 hours. When you are ready to bake, remove the pan from the refrigerator and allow it to sit out at room temperature for 30 minutes. Preheat your oven to 350 degrees. Bring the heavy cream to a boil in a small pan and cook, stirring constantly, for about 5-10 minutes or until the mixture is slightly thickened. Drizzle over the peaches. 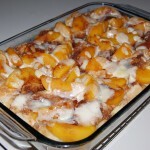 Bake the casserole, uncovered for about 40-45 minutes or until golden brown and cooked through. Cook's Note: Do not use a (29 oz.) can of peaches, you actually get more peaches by buying 2 (15 oz.) cans!